After years playing in bands like Sunset Rubdown, Frog Eyes and Wolf Parade, 2013 saw Canadian multi-instrumentalist Spencer Krug step to the forefront, as he issued his third album of hauntingly beautiful arrangements under the moniker Moonface. For our new edition of Exclaim! TV, we caught up with the singer-songwriter at the Paper Bag Records head office to capture the piano-based performer play "Black is Back in Style" off last year's critically-acclaimed Julia with Blue Jeans On LP. 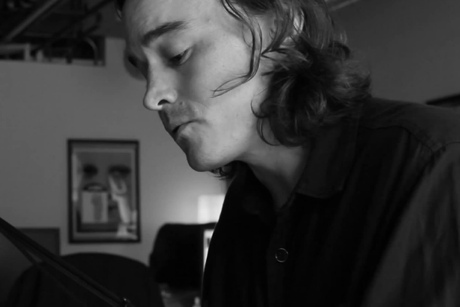 In this intimate recording session, watch as the soft-spoken Krug croons carefully into his condenser microphone, rocking back-and-forth tenderly as he plucks minimalist melodies out of his plaintive piano piece.